This has exceeded all our expectations. This meeting was organized by some neighbors of the park, through Gabriela Cerruti and Mariano Recalde. Because we all have noticed, during the campaign and through all these years in office, that there was a solid media shield for the opposition and a permanent attack to Cristina, to the Government of Cristina, to those who work with her, to the activism. What was a permanent media attack of 12 years for us and shielding for the opposition, has now become a true news blackout, where the truth is that only one voice is heard. There is a unique current of thought, with very few exceptions, so that we all are surprised every day with the media reflection of what the Government of Macri has done, in this very short time. They insist on camouflaging it, they insist on hiding, in editing it. So some concerned neighbors said that cannot just resign ourselves to that, to reading only a few newspapers such as Pagina 12 or Tiempo Argentino, or to watching a TV show that is still on the air, like 678. Because it has also been said that our President was on national television too often and I think today, in perspective, a few days after Mauricio Macri took office, we can see how cramped, how heavy, how complex is for the people when the media responds to concentrated capital and minority interests. Then, as we did throughout the campaign, when we toured parks through the city, they told me, come over on a Sunday afternoon to meet with neighbors to tell them your point of view on the economic program. Look what a meeting! Look how committed our people are! Look what strength we have! Like the President CFK said the other day, the natural place for a militant is not the Government, the natural place for a militant are the streets, squares, it is with the people, the neighbors. I had doubts about how to characterize the policy of the present Government, the Government of Mauricio Macri, because the electoral campaign was about hiding what they intended to do, who they represent, to conceal their true intentions. The election campaign was very well designed to sell joy, sell balloons, sell friendship, dialogue and hide the real interests that in these few days have shown the true character of Macri. And I hope I’m wrong, I hope they rectify. He has shown what he wants do to Argentina. They also have shown who they are, but we see them embellished, changed, their past erased, turned into something else for most people. And we, I have to say that we are deeply national, popular, and deeply democratic. They won the election, we do not denounce fraud. They are now in the Casa Rosada, they are now in the executive branch, they won by 1%, and Macri is entitled to be where he is. But what he is not entitled to is to subjugate laws, the Constitution and our rights. Even less to plunder our pockets, the pockets of people, workers, pensioners, students and the most vulnerable. They have no right even if they won by 51%. In these last few days, the current President said that he would not respect the media law, said his team has to review everything that has been done, that he will remove authorities chosen by Congress. Speaking on behalf of our Congressmen of the Front for Victory, I have to say that he also tried to get two Supreme Court judges through the window. So after having said so many things against our compañera Cristina Fernandez de Kirchner, accusing her of wanting to violate such thing as another, they tried to get two Supreme Court judges through the window, against the Constitution, against all the rules. When Cristina was President she presented the candidates to Congress, even having majority in parliament, when it failed the opposition not appointed by decree. And one day, two days, Macri assumed and tries to impose the judges he wants without respecting the Constitution, without observing the decrees, laws, without respect to Parliament, not the judiciary. No, no, because they will say that we came here to do something different. No. We came to talk, we came to the exchange, came peacefully, came mobilized and nobody has paid you to come and this is like a treat for all of us, and we are going to do it everywhere in the country. If the media dedicates solely to cover this government, we will do these meetings throughout the country, throughout Argentina, so that whoever wants to hear us will see what is happening in their country. Now back to the appointment of judges by a simple decree in the Supreme Court as if they were employees of the national executive, Mauricio Macri has left all his republicanism at the door of the Casa Rosada and has entered with his convictions, the ones he has always had, and left republicanism, manners, dialogue, at the door of the Casa Rosada to pick the judges he wanted. 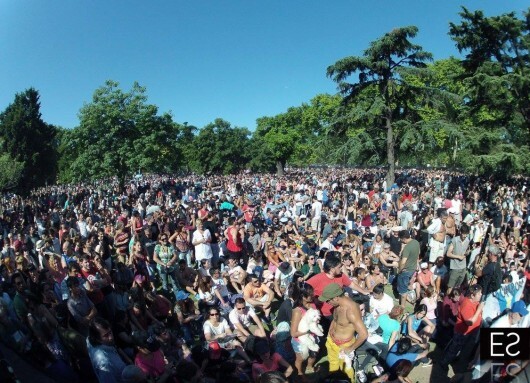 So here we are, we talked with Mariano, Gabriela, with all the people in the organization, La Campora, from different organizations, we said let´s mount a stage in case a few more people come. We did not expect this enormous level of responsibility, participation and commitment that distinguishes a mobilized people and a nation that knows it was not magic and will fight for what they have conquered. So, getting into the subject that brought us here. The idea is to present to you some thoughts, reflect, think and try to share with you what is happening in Argentina, in the region, and what we know so far, this was the challenge. It has been only a few days since Mauricio Macri is in the Casa Rosada and yet so many things happened. What I want to say today, because I’ve drafted a list of what we now know, we have learned many things by the media, from incomplete announcements, we still do not know the fine print, it is difficult to muster a comprehensive picture of what is the economic program of Mauricio Macri. Now, what I wonder is, in these days of so many announcements, when will Macri’s government announce some measure for the people. When? Because none of the measures that have been announced so far have that character. Perhaps he´s forgotten, perhaps they will coma later. And let me say again, how to make out the economic program of Mauricio Macri? We only know a little, as I just hope sincerely and humbly to be wrong and that this is not, simply another adjustment plan, a plan of the IMF. We hope not. Because that will not bring us joy, because it will bring will bring misfortune and poverty for our people. And that brings us no joy. The worse is not better for us. If it is worse for our people it is worse for us. Now we have people from LAN in Aerolíneas. People from Shell in YPF. People from the JP Morgan in the Central Bank. People from the IMF in the offices of the Government. People from Techint in the Ministry of Labour. And of course, the CRA Argentine Rural Confederation in the Ministry of Agriculture. They seem to want a country managed by its owners. They seem to want a country where the same people stand on both sides of the counter. This is a slightly deeper issue, but I think that in these twelve wonderful years of the government of Nestor Kirchner and Cristina Fernandez de Kirchner, we thought that the State had to be, because it is a democratic country, the people vote, then the State by popular vote necessarily has to be of service to the majority, not the corporations. For a long time in this neoliberal night that begins with the military dictatorship we had a State at the service of minority groups, foreign interests and large corporations and now it appears that we are headed once again, and I hope I am wrong, with privatizations through other means, just handing over the management of the State to those representing the private sector. So that it is not even necessary to privatize … so, we must give them time. We must give them time because ours is a democratic movement, it is deeply democratic. We respect the dictates of the polls and we are already working to show the people what this is about and win the next election at the polls, we are not going to wait for that, we are working. So we know who the actors, who are the good fellows who are going to carry out the economic policy of Mauricio Macri. But now I want to talk a little about their actions and their diagnoses, because most newspapers, the hegemonic newspapers who worked for his campaign, they continue to cover Mauricio Macri and hide, mask, don´t analyze the economic measures. And I do not mean the fellow workers of the press, I speak of media companies with concentrated capital who disguise themselves as independent. They are not from major economic groups. 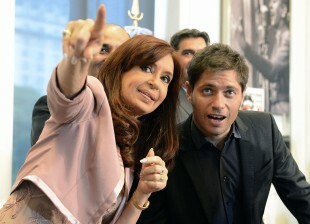 So much of the press in Argentina is itself part of economic corporations. So they accused us during the campaign that we were waging a campaign of fear. I hope I’m wrong, but I think we might have even fallen short of what they intended to do. So the press keeps trying to convince people that the neoliberal economic plan that is unveiling engineer Macri is the result of a disaster he inherited in some heavy legacy of a bomb that exploded, large and serious economic problems. So let me talk a little bit more technically these issues, because if we do not discuss them among ourselves, then we face the media brain-washing and the compañeros don´t know what to respond. Then they tried to convince people, to convince the Argentine people that he had to devalue because no reserves at the Central Bank. Let me make a comment that I made, but I have not seen in the newspaper Clarin, the newspaper La Nacion, the newspaper Perfil. I’ve seen them repeat over and over “there are no reserves” “The Government of Cristina left Macri with no reserves” and this lie is falling apart at the seams. 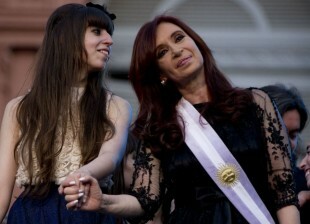 When Cristina left the presidency, the Central Bank latest publication showed 25 billion dollars of reserves. Remember back in 2003 there were 6 billion, 8000 million dollars. Next they began to make a crazy algebra discounting from those reserves some items that they figured were not real. So, they discounted some items, they refused to add up others, and calculated a total reserves of thousand, 3 thousand million dollars. And one wondered how can this be, because the Central Bank publishes its reserves according to international standards, even by the International Monetary Fund. These standards are there in place since the ’45s, from the Bretton Wood so that plain how all central banks in the world do the same math, yet the Central Bank of Argentina actually has 25 billion but they claim it is only 3 billion. How can it be? The first factor subtracted is the famous swap with China. A monetary swap product of international agreements made by our President of Argentina, Cristina Fernandez de Kirchner, with strategic and sovereign vision, a vision of international multilateralism that we will not subordinate ourselves to the United States but neither to China or Russia, or anyone. She signed a swap – remember this number – by 11,000 million. You know what they did with those 11,000 million until a week ago? They subtracted them from the reserves. They said that Chinese currency is nothing but pieces of painted paper. The second largest economy in the world were pieces of painted paper! That was no technical analysis. That was just an attempt to ley ground for the adjustment. They tried to deceive and frighten everybody by saying there were no international reserves. But you know what? So far all the government of Macri has is that swap with China, which he said so many times was no good. And today is all he has to carry out his devaluation. Because seeing that they actually had the swap, they should have not devaluated, but they did it anyways, using the swap of China. So there they are using the swap of China, a swap that President Cristina Fernandez de Kirchner negotiated for infrastructure, to improve the country, our wages and not to make a megadevaluation. So the China swap they used to subtract from the reserves, now it is part of them. Another thing they subtracted from the reserves was the alleged debt to the importers. What is the debt to the importers? Let me explain very briefly for you to have elements to answer this. Because it is not so difficult. I have already said, they try to make it difficult for us not to understand it. And when people do not understand they can just cheat you into things and get away with any scam. We want you to understand, we want you to know and we will take the time, although the media deny and obscure everything. We will explain everything we did and what they are doing today in the Casa Rosada. And we will not be silenced. The debt to importers. They claimed something like 8.000 million, 10.000 million, 5.000 million. Anyone here who has a business, any business, a hardware store, a kiosk, a store, any business knows what is like working with credit. You get credit with suppliers and pay off in 30 days, 60 days, 90 days. Every business in the world works with credit from its suppliers. So the Argentine importers, that despite the alleged restrictions imported 64 billion dollars, when Macri started to talk about the devaluation during the campaign, they said, we want to cancel all our debt in dollars today. It must be a Guinness record, because there is no place in the world where a devaluation is announced so ahead of time. That was only meant to harm our economy, to create uncertainty, to look for some king of electoral advantage. Why else would they say that they would put the dollar at 13-14, 15, 16 pesos? When a candidate with a chance to win says the dollar which is now worth $ 9.80, $ 9.60 will be worth $14 or $15 importers say I want to pay all my debt in dollars today, my debt has to be zero. And rightly so, because they know that getting the dollars to pay what they have bought today, will be 50% more expensive. So you have importers lining up to withdraw dollars and buy more merchandise to pay cheaper today. Is it clear? So that debt with importers was created by Macri after he announced his devaluation, thus accelerating imports of all the Argentina economy and its payments. And they said we left 8.000 million dollars in debt, but of course if we export 64 billion, 8 billion dollars is normal unless they want to pay everything at once. Importers just went to the Central Bank and the Central Bank was saying is I cannot sell you all together, this is the amount you usually need during an entire year, and that generated what they called debt to the importers. To sum up they subtracted 11 thousand from the China swap, then detracted 8000 for the alleged debt to the importers they had invented and they failed to add another element that is also full responsibility of the engineer Macri: the agro business. They said that there were no Central Bank reserves, there was too much public spending, they talked about inflation. Now let’s talk about inflation. You all know that in early 2014 we had a month with 3.7 points of inflation, according to our statistics and any statistics. For the last two years, every month the price increase has been slowing. That has been the result of policies like Precios Cuidados, policies for the people, and popular participation that prevents any excessive rise in prices. Nobody said inflation this year would be over 25 per cent. They said 23, 24, even Melconian, who is now a member of Macri’s cabinet. And this year the wage increase was 27-29%. This is Cristina Kirchner’s legacy: a society that lives better every day. No statistic can deny that. So those things about no reserves, about Argentina not growing for 4 years, those are all ghosts and lies. The last issue of Ferreres (friends with the current government) said that Economy was growing 1,6 when Cristina left. Private employment is growing as well. It is said by the most reliable statistics. 200,000 jobs were created in 2015. Economy is growing, there is no hyperinflation, inflation is slowing, Central Bank reserves are substantial, fiscal deficit is not out of control. So if Macri wants to adjust, to cause recession, to lower the salaries, it is Macri’s will and the people he represents’. It is not because of any legacy. Don’t let them make excuses. They must take over their actions, remove the mask, and say what they really want to do. I know Macri’s economic plan but they don’t talk about that. The Minister of Finance said that he let the economic plan to be known. But he didn’t show it to the people, or Macri’s voters, or any journalist. He showed his plan to the Secretary of the Treasury of the Government of the United States. I was wondering, maybe the Secretary of the Treasury showed the Minister the plan he had to implement, instead. They also talked about their plan with vulture funds. We know a few policies by know. They lowered the withholding tax. I met several times with farmers’ representatives. Do you know what happens? Economy is a field where there are always competing interests. There is no measure you may take that makes everyone happy. There are always competing interests. There are very powerful, concentrated interests that dominate world markets, -wrongly called ‘markets’ because they are ruled by just two or three. And when you want to represent the people, the workers, the most vulnerable, you have to make tough decisions that contradict the interests of those minorities which are very powerful. So when you make decisions against those interests and in favor of the majority, you must have the vocation to represent the people and to confront whoever you have to. It doesn’t matter if they are friends with the newspaper owners, or with the multilateral credit agencies, even if they are friends with the most powerful people in the world. 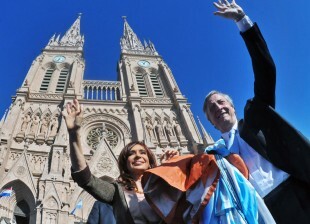 And we, compañeros, we had the great privilege to have Néstor and Cristina Fernández de Kirchner as presidents, and they never allowed themselves to overcome by contrary interests to those of the majorities. Politics was in charge of Economy for the last 12 years and it was serving the people’s interests. So it was said that they didn’t want to dialogue. To dialogue is to obey the powerful, that’s what they call dialogue. It is easy when you govern for the powerful because the hegemonic media, the concentrated economic groups, the international forums applaud you. That is very easy. The hard part is to raise and defend Argentina against the vulture funds, the imperial interests of the powers. The first decision of the new government was to cut the export duties, there was a transference of incomes. We can understand the circumstances of a destroyed international market, with countries devaluating 50-80 per cent. We understand that there are difficulties in some regional economies, but these difficulties won’t solve by getting your pants down when you have to deal with corporations. That’s the easy way. And we might have made mistakes, but –as Cristina said– we can talk to the eyes to all Argentines because we did things for the general benefit. And we heard about a plan which includes the elimination of the export duties and a 40 % devaluation that was turned into another joy and freedom revolution. Because they didn’t say: “We are devaluating”, they said: “we eliminate currency controls, we are free.” All of you can go right now to buy 2 million dollars, just go! Who are they talking to? The ones who were holding the need of buying 2 million dollars are those who were always next to them. They announced it as big news, as something to celebrate. A 15, 20 billion dollars credit line, straight to the external debt, with unknown rates and conditions. If a government is decided to devalue, and then it executes a mega-devaluation, a policy rarely seen in Argentine history, it’s hard to imagine where it will end. The result of a strong devaluation is a low demand of dollars. So, what’s the need of this policy? In fact, Carlos Menem took financial debt to avoid a devaluation. It’s contradictory. If someone considers a devaluation, there’s no need to get a 25 million dolars debt. I would like to be wrong, but these actions have one result: the increase of costs of basic goods. It might be a benefit for a few, but it’s harmful for almost everyone. Then, if you announce to the wheat producers that after a devaluation their production will cost twice its value, what will they do? They will store it or sell it at a higher price. Today we commemorate the anniversary of 19 and 20 December 2001. 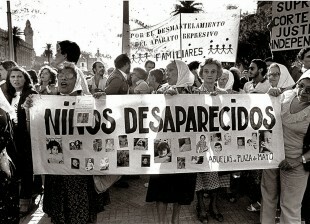 We have to remember our fallen fellows, victims of De la Rúa’s government repression. 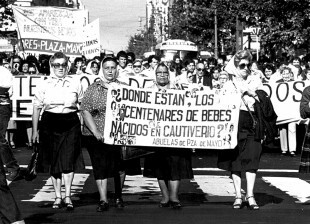 That was another alliance-government that –as Máximo Kirchner said– closed accounts with the people outside and repression. So we have to remember very well what happened in 2001. It was nothing but the result of the same policies that -so far- the current government is showing. We are still expecting at least one policy in favor of the people, as they promised. 2001 Argentina’s crisis was because for decades they implemented policies of openness, adjustment, debt, fiscal discipline, to please minorities and the IMF. For a long time, neoliberalism had Argentina as the best student, and that led to one of the biggest crises and one of the greatest conflicts of all our history. That is the result of those policies. When you devalue 40 % it has some effects. As Argentina’s economy has an imported element and an element of goods sold abroad, every product’s price in contact with the dollar through foreign market, when a devaluation takes places, if no countervailing policies, rises. Why? Because if you allow the producers of wheat to export as much as they want, and you devalue, it is convenient for them to export everything, unless they sell the wheat in the domestic market at the same price, so the price rose 40 %. Besides, they lower the withholding tax, which was a tax to care purchasing power, so effectively, imported products and exportable products’ prices rose. When we had to deal with a run on the peso, attempts to devalue, we fought, and we immediately implemented a series of policies so that if there is a movement in the exchange rate it does not affect the masses. So we implemented Ahora 12 (interest free financing for Argentine-made products), Precios Cuidados (price agreement with major chains for every day consumption products), PROCREAR (low interest mortgage financed by Social Security Administration), PROGRESAR (University Scholarships), PROCREAUTO (Price agreement and low interest loan for Argentine-made cars financed by Banco Nación). We also put a limit on loan’s interest rates, what the new Central Bank president just undid. Now as the Central Bank raised the rate to banks from 25 to 38, when you go to a bank to make a time deposit they don’t offer you 38, they offer 3 points less, and that difference of 10 points is what bankers are thanking Mauricio Macri. This is what we are going to report and we will tell them they can not rule scamming people. The State is meant to be at the service of the majority, it cannot be at the service of corporations. That is to govern democratically. Devaluation goes to prices. It goes fully to imported products because if you buy with a 9 pesos dollar and then it is 14, prices rose. And although we have made progress in import substitution, reindustrialization of the country, almost every product has an imported component. If prices rise and salaries do not rise in proportion, the demand decreases. This goes bad if they don’t implement any countervailing policy and if the State does not appear to take care of those most in need. It affects employment and occupation. We have worked hard to preserve the purchasing power of salaries, to redistribute wealth, and mainly to create and maintain jobs. We are leaving the government with a country with full employment. Those were our priorities. Argentina has refuted the theories. For many years, right-wing economists said that first the economy had to grow enough, then you could redistribute wealth, but it was never enough so redistribution never came. What did Néstor and Cristina do? They turned it around. They started with redistribution. They showed that redistribution was the best policy because when you inject resources in those who have less, it increases the demand, and that demand generates market, and that market generates production, and that production creates jobs, and that jobs increase the demand, and that demand gives place to growth, and it makes possible the extraordinary growth that took place in Argentina for the past 12 years. Distribute to grow. Keynesianism in Argentina is called Peronism. Don’t let them convince you that things will get worse, and I’m saying this to those who voted for Macri. You will have to wait, they are now pleasing the big companies, and as a result, the government gets political legitimacy and media coverage. Compañeros, don’t be victims of the lies. I remember when you joined me in other meetings and you asked me what to do next. We have to get together, we need organisation, we need to talk. They won’t shut us up, and we will be patient because we are democratic and want our voice to be heard. There’s a 49 per cent of Argentines who voted for inclusion and economic growth policies, for more rights, social justice and a welfare State. They didn’t choose unemployment, external debt. We will also explain to those who didn’t vote for us that it’s not the plan of the International Monetary Fund the most suitable to give them a better life. We hope there’s another plan. So far, they have implemented policies to benefit a few, the economic holdings. 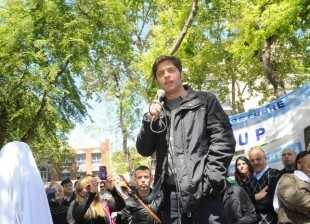 But we won’t step aside, we are going to be everywhere, in the streets, in the National Congress, working in cooperation with social movements, with all those who identify themselves as national, popular and democratic, in order to build a new Argentina and to vindicate Néstor and Cristina.